On November 1, 2007, H.E. Mme. 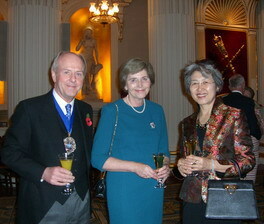 Fu Ying came to the Mansion House, and met John Stuttard, Lord Mayor of the City of London. John Stuttard introduced to Fu Ying his recent successful visit to China and noted that the rapid growth of Chinese economy left a deep impression to him. John Stuttard introduced that the delegation met Liu Mingkang, Chairman of China Banking Regulatory Commission, Li Kemu, Vice-chairman of China Insurance Regulatory Commission, and Lou Jiwei, General Manager of China Investment Corporation, visited Beijing, Shanghai, Tianjin and Nanjing, met municipal officials of these cities, and signed memorandums of cooperation with Shanghai and Tianjin for the purpose of strengthening cooperation in finance and education. Fu Ying introduced the 17th CPC National Congress and the contents of the report by general secretary Hu Jintao, she noted that China would stick to the reform and opening up policy and would try to realize peaceful development. Prime Minister Brown will visit China early next year and a Business Summit Forum will be held then in Beijing which will be participated by 100 UK enterprises and 200 Chinese enterprises. It is anticipated that a series of consensus will be achieved on the promotion of Sino-UK cooperation in multiple fields. John Stuttard noted that Chinese economy achieved a rapid development but also brought along serious environmental problems, which was clearly shown during his visit. Fu Ying noted that the Chinese government attached great importance to the environmental problems, emphasized sustainable development and made the improvement of environment as top priority of its work. Fu Ying also introduced the progress of the cooperation between cities in central China and UK on the environment governance. John Stuttard and his wife will leave their posts, Mrs. Stuttard held a farewell cocktail party that night and all participants thought highly of her charitable acts during her term.